I’ve enjoyed William Kent Krueger‘s Cork O’Connor mystery series, thirteen mysteries featuring a former Chicago cop turned small-town Minnesota sheriff. The books are well-written, compellingly atmospheric, and feature strong characterization and plotting. With Ordinary Grace, Krueger has elevated his writing even further. The book begins in the voice of Frank Drum, recalling the summer of 1961, when he was 13 years old. Just one page long, this prologue sets the tone for the story that follows, a tragic story and one filled with loss and anguish. It begins: All the dying that summer began with the death of a child, a boy with golden hair and thick glasses, killed on the railroad tracks outside New Bremen, Minnesota, sliced into pieces by a thousand tons of steel speeding across the prairie toward South Dakota. And ends: In the end maybe that’s what the summer was about. I was no older than Bobby and didn’t understand such things hen. I’ve come four decades since but I’m not sure that even now I fully understand. I still spend a lot of time thinking about the events of that summer. About the terrible price of wisdom. The awful grace of God. And then the story begins, first person, as it happens to 13-year-old Frank Drum. His father, a Methodist minister, is a rock upon whom many lean. His mother dreams of a better, more fulfilling life for Frank’s sister Ariel, who is a talented pianist, accepted to Juilliard in the fall. And his younger brother, Jake, is the tag-along kid with a stutter under pressure. What unfolds is shocking: Ariel disappears. When her body is found in the river, suspicion lights on first one, then another of the town’s inhabitants, and Frank learns that many people are not as they seem, including Ariel herself. What Frank learns about betrayal, his family and his own capacity for understanding and forgiveness is astonishingly moving. Read the book for the mystery – it’s a good one. But you’ll remember it for the insights it offers and the emotions it evokes. Ordinary Grace reminds me, in many ways, of The Round House by Louise Erdich (Lunchbox review here). Both have the framing story of a recollection by a grown man of events that occurred many years in the past. Both feature a shocking crime and its repercussions. And both are, at heart, a tragic coming-of-age story. The Round House won the National Book Award for fiction in 2012. I can only hope Ordinary Grace receives the accolades it deserves! 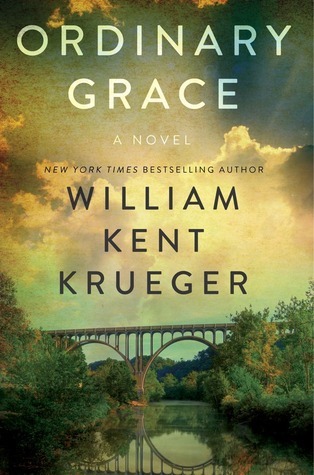 This entry was posted in Commentary, Review and tagged literary mystery, Louise Erdich, National book award, Ordinary Grace, The Round House, William Kent Krueger. Bookmark the permalink.